If one takes into account order bookings, collaborations, product developments and prospective markets, buying shares of fuel cell companies looks ever more promising. But the capitalization of the market leaders in fuel cells described in this article amount to a mere USD 750 million – a stark contrast to Tesla, the electric car pioneer, which has a market cap of USD 34 billion. 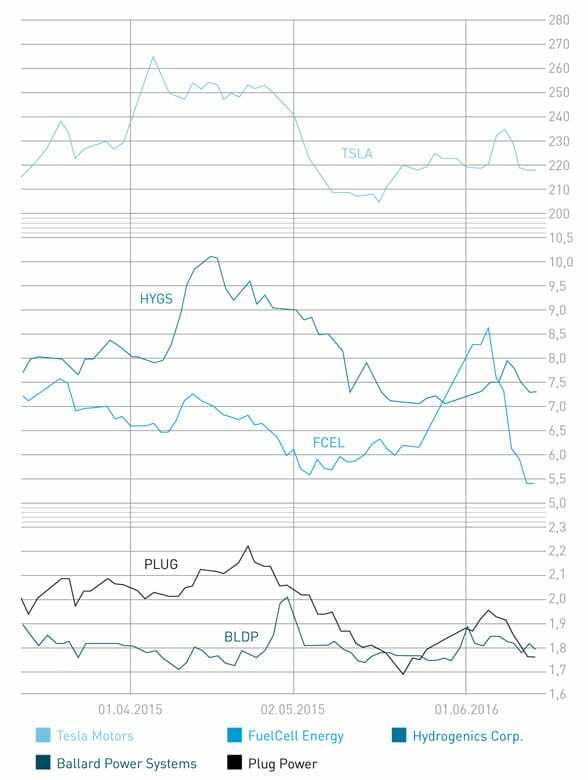 These companies may very well get closer over the coming years, if Tesla gradually loses in value while fuel cell shares increase considerably in price. This can happen as soon as people become increasingly aware of the fact that fuel cells combined with “green hydrogen” represent a serious and growing competition to battery-only systems. Treating Alstom, Hydrogenics and Ballard as individual commercial instances misses the point. Deliberate orchestration of transition of the world’s railroads to wireless fuel cell electrification (hydrail) for societal—climate and capital preservation—reasons has been vigorously pursued since 2005 via annual International Hydrail Conferences in the US, Denmark, Spain, Turkey, the UK, Canada and Germany. The eventual change was inevitable; bringing it about much sooner is socially ethical.